WEST HAVEN – Jimmy Ryan kicked off the Vermont 200 Championship Weekend with a long awaited checkered flag on “Shootout Saturday” at Devil’s Bowl Speedway. Ryan led a parade of stock car drivers through victory lane in a series of bonus races following first-round qualifying for the annual year-end asphalt championship event. The main events was schedule to be run on Sunday but was postponed until Saturday, Sept. 19, due to rain. Ryan’s win came in a special 10-lap shootout for non-feature winners in the Modified division. The veteran from Whiting, Vt., fought off an early challenge from Billy Lussier before stretching out his lead and taking the win, which came just two weeks after getting his car upside down. “After the year we’ve had, I’ll take a win any way I can get it,” Ryan said in victory lane. Lussier finished second ahead of Jason Furman, Bob Kilburn, and Dave Snow. The championship battle tightened during the qualifying races. Title rivals Ron Proctor and Vince Quenneville Jr. each earned five bonus points after winning their respective heat races, but Quenneville inched one point closer to Proctor in the semi-feature. The two drivers are now separated by just four points – the equivalent of two on-track positions – entering the Championship finales. Proctor, Quenneville, and Leon Gonyo each collected $100 bonuses after winning their heats; Todd Stone won the semi-feature. Seth Bridge of Mendon, Vt., carried his first-ever checkered flag after taking the non-winner shootout in the Late Model division. Rookie Tony Salerno of Mineville, N.Y., got his first win in the Renegade shootout, and rookie Bradley Bertrand of Ferrisburgh, Vt., did the same in the Mini Stocks. WEST HAVEN – Devil’s Bowl Speedway had to postpone its asphalt stock car racing season finale to Saturday night, Sept. 19 due to rain. Extra-distance feature events will be run to close out the Vermont 200 Championship Weekend, and champions will be crowned for the NASCAR Whelen All-American Series. First-round qualifying races were completed on Saturday, Sept. 12 before wet weather moved into the area overnight. Morning showers and a forecast for continued rain throughout the day on Sunday forced the postponement. Racing will return Saturday night, Sept. 19 at 5 p.m. All two-day grandstand tickets and pit area wristbands will be honored. In case of rain on Saturday, one final attempt to complete the event will be made on Sunday, Sept. 20 at 1:30 p.m. The Modified division will run twin 50-lap feature races as Ron Proctor and Vince Quenneville Jr. vie for the track championship. Josh Masterson will try to wrap up his first championship in the Late Model division with a 100-lap main event, while Robert Gordon aims at the Renegade championship and Chris LaVair goes for the Mini Stock title. The Enduro Series will also be in action with a 50-lap race. General admission for the Vermont 200 is $20 on Saturday, Sept. 19; kids age 12 and under will be admitted free. 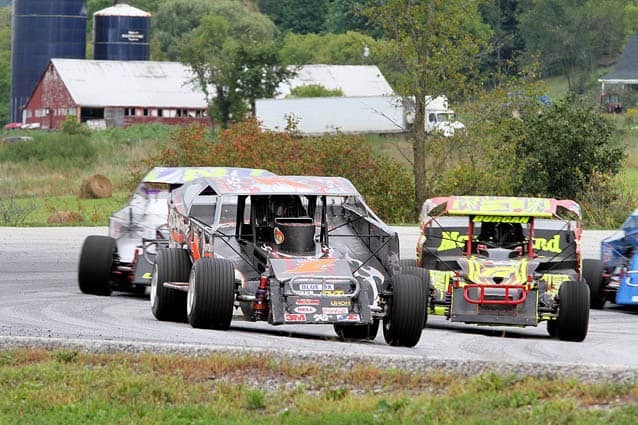 Grandstands open at 3 p.m. and racing is at 5 p.m.
Devil’s Bowl Speedway is located on Route 22A in West Haven, Vt., four miles north of Exit 2 on U.S. Route 4. For more information, visit www.DevilsBowlSpeedwayVT.com.